Koh Samui is located in the south of Thailand and people who want to enjoy the tropical paradise come here. A lovely natural surrounded of the traditional coconut trees stretching over the whole of Koh Samui. The island is located 660 km south of Bangkok, and the surface is about 250 square kilometre Koh Samui is Thailand's third largest island after Phuket and Koh Chang island is at 25 km and at its widest point 21 kilometres around the island is not less than 80 other small picturesque islands of which only a few are inhabited. On the island live approx 45,000 inhabitants. Far many more if you want to count all the guest workers who each year seek out the island to earn a living from tourism. The island is particularly lovely for the huge amounts coconut trees, one plantation after another, and 90% of the island coconuts are exported to Bangkok because coconuts are the highest quality in all of Thailand. Tourism is the island's second most important source of revenue for the coconuts. Besides from the coconut Durjan pineapple and rambutan also grow here. Koh Samui was discovered in the 1970s by the hippies and has since then huge increased in popularity. In the early 1990s they built a small airport (IATA code: USM) and it has meant that tourism on the island has increased and one hotel after another has been built. The range of restaurants and entertainment are almost completely unrestricted in the island. Just like in most places in Thailand is fish a natural resource and Koh Samui is no exception because you can eat very good seafood here right on the beach or one of the many restaurants on the island. 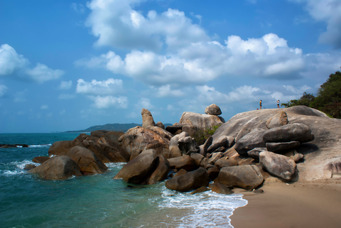 Chaweng and Lamai are the two most famous and finest beaches on the island. Chaweng is the largest and has a rich variety of both accommodation hotels and resorts to choose from, not least entertainment possibilities that are world class. Although the island has had tourists for many years, one can without problems find their own little oasis and can be completely alone without other tourists will find you. The beach of Chaweng, the island's longest and the low water is particularly suitable for families with children. range of accommodations and shopping is the island's most popular characteristic of Chaweng is the famous sand and proximity to just about everything you can imagine for a perfect holiday in Thailand. Lamai Beach has always been more affordable option both for food and accommodation, therefore, there has been a development at a younger audience, when hippies came to Koh Samui it was to Lamai they flocked and most bars played reggae music. Lamai have a wide variety of discos and other entertainment. Bo Phut is one of the island's old fishing village and the oldest village on the island of Bo Phut is located north and today it has developed into a tourist resort with cozy resorts and great restaurants. What you see today is the fishing village of "Fisherman Village" where the fish is not sold but there is a string with both shopping and restaurants. Boats depart from here to the popular island of Koh Pha Ngan where they organize the famous "Full Moon Party"
beach has a soft lovely beach and calm water. All around there are many more beaches as Maenam, Bang Po, and all beaches along with many other developed all the time. No matter where on Koh Samui you want to be, it has something for everyone and the distances makes you go around the island in less than 1 hour unless there is long traffic ques. What you absolutely should not miss when traveling to Koh Samui is to visit the rock formation Grandma and Grandpa, there are rock formations that have the look like male and female genitalia. Take the opportunity to take a dip at the small lagoon located at Grandma and Grandpa. Are you interested in snakes, make a visit to Samui Snake Farm, where they display Cobras and other reptiles up to an audience. Remember not to sit too close if you have fear of snakes then it is part of the show to get a snake or two around your neck. For us Scandinavians the waterfalls on Samui is not so fascinating, especially if you have walked in the Swedish mountains, but of course it may be worth it to see it, and often includes a visit to the famous waterfalls on Samui if you choose to travel with the tour. Big Buddha on Samui has been since it was built in the island's main hallmark. You see it on the weather permits already when you land at Samui Airport. Buddha statue is a full 12 feet tall and is well worth a visit, not at least for the magnificent views when you have walked all the steps to get up to the Buddha. In Thailand, just like at home, you can never be sure of the weather, but there is a rule of thumb for Koh Samui, from January to June, the weather is dry and the sea should be easy, from July to October it rains off and on. From November to January, it can be windy. The sunniest climate in Thailand you’ll get in Rayong and Mae Phim from November to March. How do you travel to Samui? You can fly direct to Koh Samui by both Thai Airways and Bangkok Airways. The airline that flies the most times to Samui is Bangkok Airways. It is quite expensive to fly directly from Bangkok to Koh Samui therefore there are alternative and more affordable options. Thai Airwys fly several times a day to Surat Thani which is on the mainland, it takes 3 hours to transport yourself from Surat Thani Airport to Koh Samui and the journey consists of 1.5 hours of bus transport and then 1.5 hours journey by ferry across to island. From the domestic airport, Don Muang, you can fly with both Nok Air and Thai Air Asia to Surat Thani.